Jesse Cannone came from the origins of successful personal trainer in the Greater Washington, D.C.area. He found that many people suffered needlessly with lower back pain and sciatica. Traditional doctors just want people to get the quick fix of surgery which isn't always effective or even needed. Jesse left has successful business to focus on helping people relief back pain, neck pain and sciatica. Jesse's passion is to teach people how to eliminate chronic pain and live a healthier life for over 10 years. With the support of massage therapist Steve Heffero, Jesse created the world's first self-treatment program to help people self-assess the reasons for their chronic pain. This system, Lose the Back Pain, has been sold in over 100 countries. 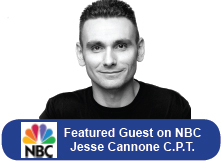 Jesse has been featured as a guest on NBC being recognized as one of the leading back pain relief experts in the United States!